John Milito's Amazing Adventures: Cuba 3: Quick, to the Countryside! Today we had a tour that would give us our first look at Cuba outside of Havana. We don't usually do so many tours, but we wanted to have proof of our itinerary in case there were any US Immigration questions about our trip. We started off with another monster breakfast. This time the lady insisted we try this mango something. It was like baby food consistency and just plopped on a plate. I tasted it and it was fine, but I wasn't really sure what the heck I was supposed to do with it. A bumper sticker on the house of the president of the local CDR that we explained yesterday. We spent the day driving around to different sites in the Pinar del Río Province, which is known for tobacco. First stop unsurprisingly was a small tobacco farm. They had some banana trees as well which you can see here. The tobacco was just sprouts at this point so there wasn't much to see in the fields. The barn where they were aging the tobacco was much more interesting. The smell was great. It was interesting because I would expect a leaf hanging up to cure would be super dry and brittle, but these were still pretty moist and spongy. I'm still a bit hazy on the details but I want to say that this is the tobacco that would go inside a cigar, which is different from the "wrapper" leaf that goes around the outside to hold it all together. I think it's interesting because when I think of the Caribbean I think super laid back, sipping on rum under a palm tree all day. Cuba takes that and puts a layer of repressive dictatorship on top. So I got alternating feelings of Cuba being hell and heaven throughout each day. I bought a few Cohiba Behikes which were pretty killer. We got up a bit earlier for this trip so I was trying to take naps in the cab. This driver was driving a bit fast though, which is fine, but a couple of times I was awoken by my head hitting the roof of the car when we hit a bump. It was great fun and I said zero curse words. It was even more odd to see classic American cars zooming around in the country side. Luckily we had a modern car for this drive. The classics are fun but not always real comfortable. So I'm stuck here watching TV"
started playing I told our guide that she's our friend the communist. She didn't think that was funny. In Havana there are people walking around selling peanuts in these tiny cones for a tiny amount of money. I want to say they cost like a penny. Next we checked out these interesting foliage covered outcroppings called mogotes in the Viñales Valley. This was a super touristy place, complete with a little band playing nearby for tips. Next stop was a boat ride through some underground river. We had to stop first and have a cocktail made from fresh squeezed sugarcane though. One doesn't want to overexert one's self. When we got in the caves there was a massive line that took maybe 45 minutes to traverse. I got to listen to an annoying Scottish woman insult the US at length to her Cuban tour guide. The Cuban guy knew we were American though and did a good job of being diplomatic. He did say that "Cuba and Puerto Rico are two wings of the same bird" which I've heard once or twice from other Cubans. Lydia and I agreed that the boat ride was a yawn. It reminded me of taking a duck boat ride trip in the Wisconsin Dells. There was a lot of "if you turn your head sideways this stalactite looks like the Virgin Mary!" Good story bro. An unforeseen drawback of traveling so hard that Carmen Sandiego can't find me is that I'm probably a bit jaded. In Belize we inner tubed through underground rivers filled with Mayan artifacts, bats, and scorpion spiders. One thing that I'll never get tired of though is eating lunch. Hurray lunch! The main course was whatever but the flan at the end... That flan at the end though? Next up on our tour was a peak at the town of Viñales. It was very storybook-esque with quaint brightly colored houses everywhere. It seemed like every house doubled as a bed and breakfast. It's such an odd system with like two distinct economies operating next to one another. The locals are crowded around buying essentials out of this drab grey box shop and across the street there's a bunch of tourists sipping daiquiris. I thought a few people back home might appreciate a cigar so I stocked up on the less fancy variety here. And maybe some rum too. Sue me. 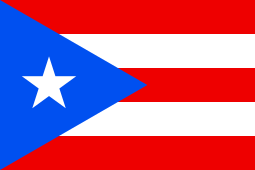 Puerto Rico modeled their flag on Cuba's. Last and very least was a visit to the "prehistoric wall painting". I thought this place was going to be a painting from a prehistoric age, maybe some dudes smoking cigars and throwing spears at a Cuban saber tooth tiger. Nope. This was a painting that some free time flush joker created in the 70s of colorful dinosaurs on the side of a cliff. Yawn I say to you sir! YAWN! Havana was right where we left it. This bread shop was so committed to the revolution they painted big Castro speeches on the walls. Several main roads were being repaved for Obama's upcoming visit. Apparently that entails smearing the roads with tar first so that everyone can track black footprints everywhere. Airtight plan. I finished the night by taking Kid Chocolate to the Museo del Chocolate for dessert. If being communist means washing down chocolate with chocolate milk everyday then go ahead and get me a red beret.